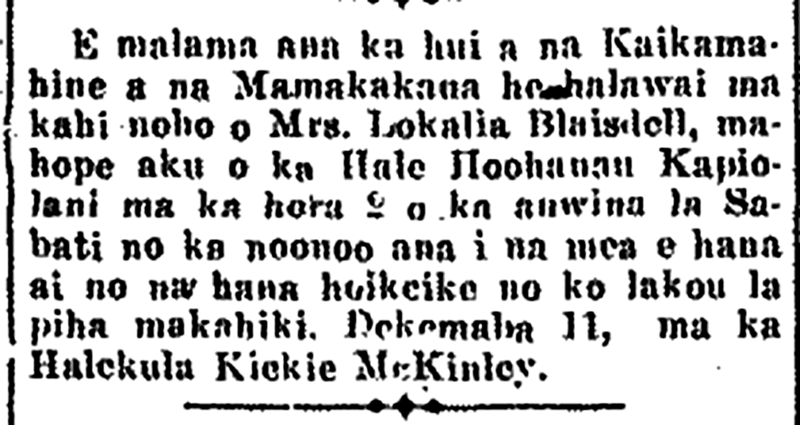 E o, e Kauikeaouli, ka Moi Lokomaikai, 1921. COMMEMORATING THE DAY OF BIRTH OF KAUIKEAOULI. Daughters of Hawaiian Warriors? 1915. The association of Daughters of the Mamakakaua will hold a meeting at the residence of Mrs. Lokalia Blaisdell, behind the Kapiolani Maternity Home at 2 o’clock in the afternoon, Sunday, to consider what to do at the presentation for the day of their anniversary. December 11, at the McKinley High School [Halekula Kiekie McKinley]. Ka Nupepa Kuokoa, Buke LIII, Helu 49, Aoao 4. Dekemaba 3, 1915. “Love your neighbor as yourself and let the old and young go unmolested on the highway,” is the motto of a new society to be known as the Daughters and Sons of Hawaiian Warriors, which has just filed its papers with the registrar of public accounts. Those who have signed as charter members are Alice K. Macfarlane, Martha Dowsett, Eugenia K. Reis, Annie Conradt, and Mauriel Shingle [Muriel Campbell Shingle]. All members are requested to collect old Hawaiian war relics, such as laumeki or javelin, the pahoa or dagger, the laau palua [laau palau] or war club, the pololu or war spear, the laau kaa or baton of a drum major, the maa or sling and the ikoi or mystery stone which hung over doorways and struck dead all enemies who attempted to enter a house protected by it. In addition the members must collect kahilis or feather standards, helmets, leis, talismans and pieces of ancient kapa cloth. The society emblem is the coat of arms of Lani-Alii Okinapauokalani, with all her sacred rights. Honolulu Star-Bulletin, Volume XXV, Number 7966, Page 14. October 24, 1917. More Ernest Kaai—meeting a Hawaiian living in Australia, 1925. This is a picture of L. G. Kaainoa and Ernest Kaai. Mr. Kaai found Kaainoa in Australia, and he wants the help from Hawaiians to provide him a means for him to once again tread upon the land of his birth. From the left, L. G. Kaainoa, Ernest Kaai. L. G. Kaainoa has been away from Hawaii for 50 years now without his family’s knowledge, or knowing even if he has ohana left alive here; Ernest Kaai sent a letter to the Ahahui Mamakakaua [Sons and Daughters of Hawaiian Warriors] telling them of the desire of Kaainoa (who now lives in New South Wales, Australia), to return to his homeland were he to receive assistance from Hawaii’s people to pay his expenses for the return. According to the explanation in the letter of Ernest Kaai, L. G. Kaainoa is now 72 years old, and being that he is very old, the government provides him a pension of 4 dollars a week. Ernest Kaai says he found Kaainoa at a place called Murwillumbah. He left Hawaii nei in his youth and it is there that he lived until his old age. He married a woman, but she died 12 years earlier. He is infirm and cannot do hard labor. But he is given benefits by the government of 4 dollars every week. Kaainoa is well liked by the people there, and when he met with Ernest Kaai, he made clear his hope to return to his homeland, if not for any other reason, but for his desire to leave his bones in Hawaii nei. He is still very good at Hawaiian, yet is somewhat clumsy, but he is most fluent in English. According to Kaai in his letter, he was staying along with his fellow musicians at a place called Tweed Heads, where they were waiting for the arrival of a ship to take them to Murbah. When the ship arrived, and after they loaded their belongings aboard, it was then they saw Mr. Kaainoa. He came all the way to meet with Kaai folk, and to welcome him to his town where he has lived for 50 years. At their meeting, Kaainoa gave his hand, saying, “Aloha, aloha, aloha!” His heart was full while he expressed his great aloha as his tears flowed, while some others joined in with him. After those feelings of aloha calmed within him, and his crying stopped, it was then that he began to speak, asking about some people in Hawaii nei. And as Kaai did not know them, he told him so. All he could think of that Kaainoa could ask of was the alii of Hawaii nei. Kaai and his musical group spent two nights at Murbah, and on those two nights, they saw Kaainoa sitting way up front of the theater house. And when the singing was over, he continued to stomp on the floor as if he was so proud of this singing of his very own people. The main reason Mr. Kaai wrote to the Ahahui Mamakakaua by way of Mrs. A. P. Taylor, the president of the Association, was to look for assistance; if she could ask the other Hawaiian associations to join in on this charitable endeavor to bring Kaainoa back to Hawaii nei for him to leave his bones in the soil of his homeland. To follow through on this plea, Mrs. Taylor met with the president of the Hawaiian Civic Club [Kalapu Hoeueu Hawaii], and the secretary of the Kaahumanu Society; and in the upcoming days, the other Hawaiian organizations will learn about this assistance of their fellow Hawaiian. Ka Nupepa Kuokoa, Buke LXIV, Helu 10, Aoao 1. Maraki 5, 1925.